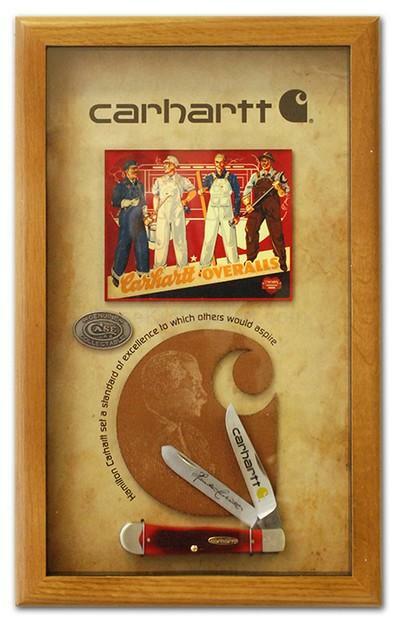 "Carhartt® Overalls Commemorative Trapper" Case® knives have been handcrafted by skilled Artisans since 1889 - made with quality, attention to detail, and uncommon pride. This commemorative continues in that fine tradition, offering further testimony to the art of knife-making as defined by Case. This Barnboard Jigged dark Red Bone Trapper (6254) carries the brass finished Carhartt shield, brushed finished Lazy Duck cap end bolster. The Tru-Sharp® surgical steel Clip blade embellished with "Carhartt company founder, Hamilton Carhartt's, signature. Production of this commemorative is limited to 125. Each carries the Case "Long Tail C" serialization on the bolster and is carefully arranged in a handcrafted shadow box, complete with a Genuine Case Collectible Medallion. As with all natural material color and texture may vary. Made in the USA.